We are pleased to introduce an updated version of the SHRM Essentials of Human Resources program! 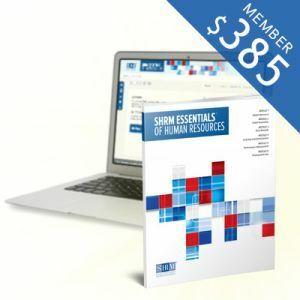 Developed by leading HR experts, and HR practitioners, the SHRM Essentials® of Human Resources program covers introductory HR topics and behavioral competencies in a condensed, easy-to-understand format. Topics include; employment law, selecting qualified employees, compensation, orientation and training, and the performance management process. This program is ideal for those who are new to HR or those who perform HR tasks as a part of their many roles. Access to the web-based software is valid 18 months from the date of purchase. Access is granted to the original purchaser only as a Limited License and grants that user a limited, non-exclusive, non-transferable personal license to access and use the online learning center in the SHRM Essentials program web site and its content for the user’s personal, non-commercial use only. Volume Discounts are available. Contact SHRM Corporate Specialist Colin Moylan at +1-651-905-2617 or colin.moylan@shrm.org for details.